Kenneth Cadwallader's paintings are lush and dynamic representations of the world around him. Inspired by just about everything, Cadwallader paints subjects ranging from landscape to floral to figure with sumptuous, spontaneous brushwork and bold, beautiful color. Born in 1971 and raised in Southwest Michigan, Kenneth Cadwallader's artistic talent was something of a novelty when he was a boy, "amazing but impractical". Without direct encouragement, he abandoned a serious pursuit of art in favor of a more traditional career path. However, after a brief stint in sales, Cadwallader began to reconsider and eventually enrolled at Kendall College of Art and Design in Grand Rapids, MI where he received his bachelors degree. While in attendance at Kendall, he was invited to study at The Royal College of Arts in London, England. It was in London that he found his artistic direction. Struck by the pure and simple beauty of representational impressionism, he knew that therein lay his own artistic voice. "I had the opportunity to see some real paintings, something you don't get much exposure to in Grand Rapids. I was particularly struck- in fact, blown away- by the work of J. W. Waterhouse. I was in London to study illustration, but I knew almost immediately that my work would take a different direction." London whet Cadwallader's appetite for a diverse artistic community, and, for this reason, upon completion of his studies at The Royal College of Arts he moved to Chicago. There he had the opportunity to pursue his newfound devotion to impressionist painting at the Palette and Chisel Academy of Fine Arts. In addition to helping him to develop a painting style, the academy introduced Cadwallader to the work of world-famous painter Richard Schmid, a former president of the school. Cadwallader sent Schmid a letter with photos of his own paintings and, to his delight, Schmid replied with encouragement and admiration and an invitation to study and paint beside Richard Schmid for nearly a year. "His critiques never commented on my style, except to help me to find my own. He was very careful not to influence me in this respect." Nonetheless, he admits, traces of Schmid's influence can be seen is his work, particularly in the fluid brushwork and confident spontaneity. Kenneth Cadwallader travels widely on painting trips and always paints directly from life. Whether in the studio with a model or still life, or painting a landscape or figure en plein air, Cadwallader prefers to see the subject as described by the natural world. The results are fresh and direct with no artifice and no over-working. In typically unaffected style, Cadwallader explains, "I paint because I enjoy it. Though it can be difficult at times, it's really quite easy to do something you love." For the past three years, Cadwallader has been living and painting for months at a time in southern China. Among the many accomplishments of this young artist are recognition and numerous awards from nationally prestigious organizations including Arts for the Parks, Oil Painters of America and The Portrait Society of America. Cadwallader is the new president of Oil Painters of America. His work has been featured in such publications as American Artist, International Artist, Southwest Art, The Artist's Magazine, Artist Sketchbook Magazine, and Wildlife Art. 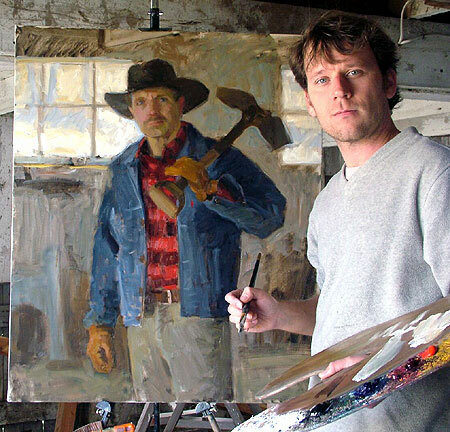 Kenneth Cadwallader currently maintains a studio in Grand Rapids, Michigan. When he is not painting, Cadwallader enjoys reading about quantum physics and theory. His paintings are widely collected in the United States and abroad.